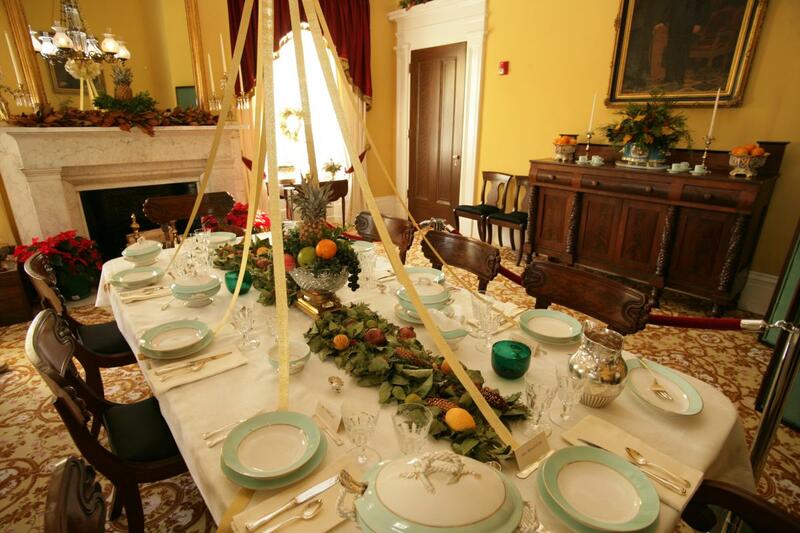 One of Milledgeville’s favorite Holiday traditions is touring Georgia’s Old Governor’s Mansion while it is decorated for Christmas celebrations. In case you missed it, here are 5 insider peeks to make you put it on your 2018 bucket list! 1. 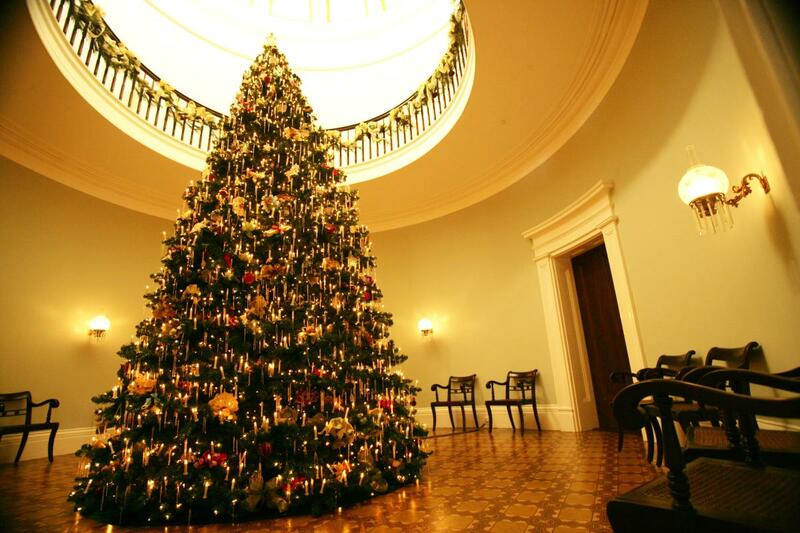 The largest decoration in the Mansion is the 28-foot-tall tree found in the rotunda. The Old Governor’s Mansion tree has approximately 2000 lights. In addition to over 1500 crystal icicles and the ornaments were made from natural materials found in the yard or around the house. Trees became popular in the United States during the reign of Queen Victoria in England, whose German husband Albert placed one in Buckingham Palace. The use of trees spread throughout the country and were in widespread usage by the 1850s. 2. 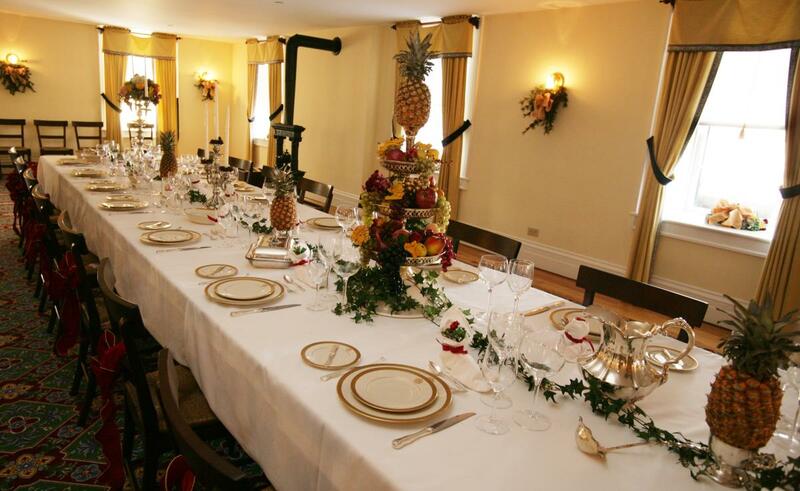 Decorations throughout the Mansion are made with large amounts of live greenery, fresh fruits, and other materials that would have been available within the household or around the grounds. Wherever you see fruits used in the decorations that this was a way to show the wealth of the family as most individual could only afford fruit only occasionally. 3. Christmas was the slaves one day off for the year. They celebrated with song, dance, and usually received new clothes. 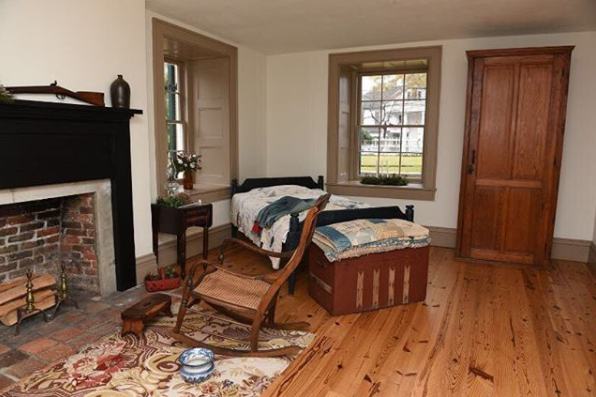 Please note the rooms were decorated with left over materials from the “public” spaces and with wreaths of items they would use in their daily work such as bay, herbs, etc. 4. Christmas day usually begin with an early breakfast, church services, and then dinner was served between 1 and 3 in the afternoon. Dinners served on Christmas Day usually included Turkey, Ham, Oysters, Beets, Turnips, Mashed Potatoes, Cole Slaw, Celery, Sweet Potatoes, Plum Pudding, Fruit, Nuts, Pies and Coffee. 5. The Children’s nursery is adorned with a gum-drop tree, which was a traditional seasonal decoration, along with their own Christmas tree (usually the kids made their own tree and ornaments). 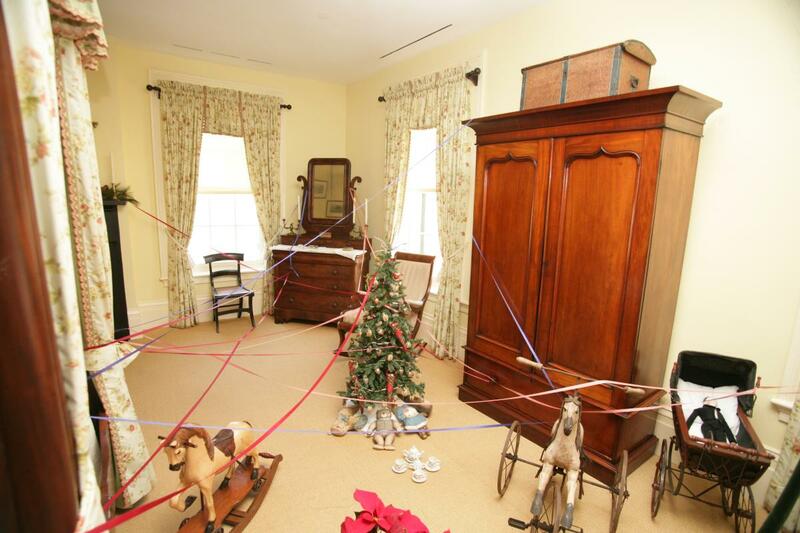 On Christmas eve, the children and their parents would “web” the room with various colors of ribbon. On Christmas morning, the children would be assigned a color and follow the ribbon through the maze to find their presents left by Santa. Usually, children received no more than one-two presents, thus making this method effective. For more insider information about Georgia’s Old Governor’s Mansion follow them on Instagram. Meet Bonnie. 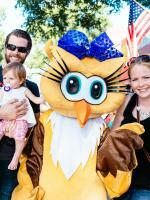 Bonnie is the social media voice, website whiz and project coordinator for the Milledgeville-Baldwin CVB. Bonnie fell in love with Milly while she attended Georgia College and worked at the downtown staple establishment, The Brick. Now married and chasing a toddler, she appreciates Milledgeville’s family friendly adventures, from walking at the Oconee River Greenway to attending a First Friday.